I've been having fun these days shopping at Dollar Tree as part of my everyday errands. One thing I have done is explored Dollar Tree's freezer case. And behold, good news! 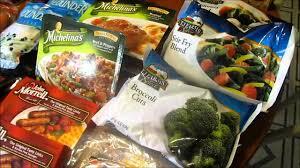 You can get great frozen vegetables at Dollar Tree. A whole pound of mixed veg, California Blend or Stir Fry, for $1. That beats what you spend other places. So I picked up a few. I bought the blends, plus a pound of broccoli. You are lucky, you know, to find broccoli for $1 a pound, and here it is for that price all neatly cut up for you. And speaking of good news ... When I got home something made me look at the bags closely. "God is strong and can keep you from falling. He can bring you before His glory without any wrong in you and give you great joy." -- Jude 1:24. That was California Blend speaking. Broccoli Cuts had their own quote. "Fear not, for I am with you; be not dismayed, for I am your God; I will strengthen you, I will help you, I will uphold you with my righteous right hand." -- Isaiah 41:10. It is like the Aldi eggs, where you open the carton and read a psalm! I am telling you, it is the little things like this that can make your day. The Lord speaks to you from unexpected places! These veggies are from TJ Farms. Let us look them up. I get the idea it is just this generic brand under the umbrella of Flagship Food Group. There is no mention of Scripture. And yet still, there it is. Someone is having a little fun, somewhere. These are the frozen vegetables the Lord has made.